The Amazonia Collection is committed to providing premium quality sets with an elegant design that will make your home stand out above the rest. Crafted from solid Eucalyptus Grandis wood, grown in 100% managed forests in Brazil and certified by the FSC (Forest Stewardship Council), this eucalyptus furniture is known for its longevity and craftsmanship at an affordable price. The seats are made out of Weathernet, our durable textile sling that is quick drying and meant to provide the most comfortable seat. Enjoy your patio in style with these great sets from our Amazonia Collection. Armchair Dimensions: 24Lx22Wx31H. Armchair Seat Dimensions: 18Dx18Wx18H. Home Styles Biscayne Arm Chair is constructed of cast aluminum with a bronze finish. Features include powder coat finish sealed with a clear coat to protect finish, and nylon glides on all legs. Chairs are packed two per carton. Item Size: 22.83w 21.65d 32.68h Seat height 15.5h. Stainless steel hardware. Bahamas 4-Piece Eucalyptus Patio Armchair Set with Brown Sling Seat The Amazonia Collection is committed to providing premium quality sets with an elegant design that will make your home stand out above the rest. Crafted from solid Eucalyptus Grandis wood, grown in 100% managed forests in Brazil and certified by the FSC (Forest Stewardship Council), this eucalyptus furniture is known for its longevity and craftsmanship at an affordable price. The seats are made out of Weathernet, our durable textile sling that is quick drying and meant to provide the most comfortable seat. Enjoy your patio in style with these great sets from our Amazonia Collection. 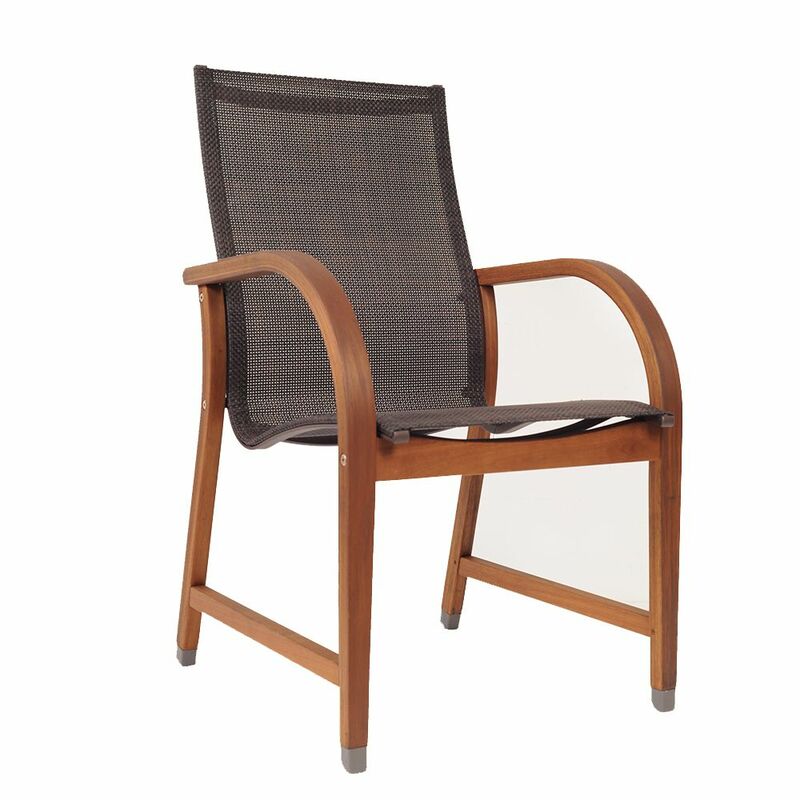 Bahamas 4-Piece Eucalyptus Patio Armchair Set with Brown Sling Seat is rated 4.7 out of 5 by 3. Rated 4 out of 5 by JEM from Lightweight for moving around the porch and comfortable to sit in. Lightweight for moving around the porch and comfortable to sit in. Rated 5 out of 5 by Rose from I have had these chairs for several years and needed... I have had these chairs for several years and needed 4 more for our deck, I am grateful I found them at Home Depot. I searched around and this was the only place I could find a set of 4 at this price. They are worth the price.